Neiman Marcus: "The Christmas Book" | The House of Martins The House of Martins: Neiman Marcus: "The Christmas Book"
Neiman Marcus: "The Christmas Book"
Every year I look forward to browsing Neiman Marcus' Christmas Book and the great fantasy gifts inside. Some are so incredibly over the top that I can't imagine ever really wanting - but they are fun to look at. This year is no exception. Here are my favorites. 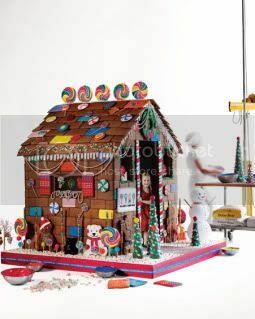 First - The Edible Gingerbread Playhouse by Dylan's Candy Bar. What an amazing gift to get as a little girl. A giant playhouse that you could eat! Cookies, gummies, mints... what else could a kid want? Only $15,000. A drop in the bucket compared to my next two. Second would make a great gift for me - if anyone is wonder what to get me. The His & Hers MetroShip Luxury Houseboat. Part of me has always wanted to live on a houseboat - and for $250,000 - this is my chance. 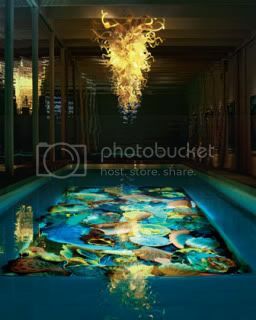 Last - but not least - is the Chihuly Pool Sculpture Installation. For this one you already need to have the swimming pool - but for $1.5 million you can get a one of a kind Chihuly sculpture placed at the bottom of your swimming pool. I'm not sure if you'd be able to stand on it very well - but art is art. Where have I been? I've never seen the Neiman Marcus Christmas Book. Looks like I need to get my hands on it though because that Gingerbread house is a must have. Ohhh the Christmas Book is a must. The fantasy gifts are amazing. Every year.